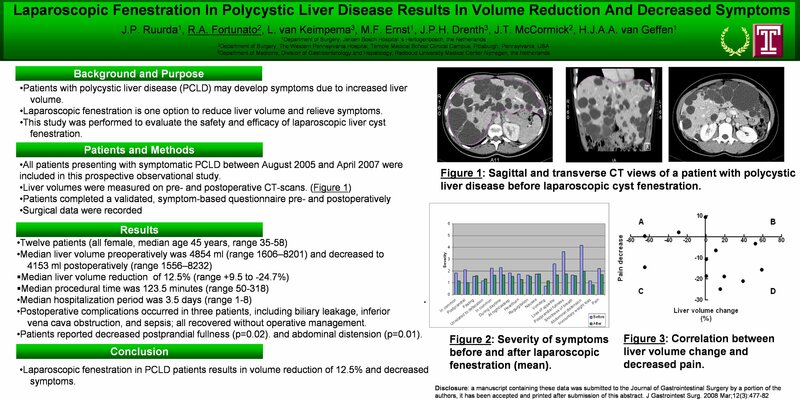 Laparoscopic fenestration of liver cysts in patients with polycystic liver disease results in syptomatic improvement and volume reduction. Introduction: Patients with polycystic liver disease (PCLD) may develop symptoms due to increased liver volume. Laparoscopic liver cyst fenestration is a technique used to reduce liver volume and relieve symptoms. This study was performed to evaluate the safety and efficacy of laparoscopic liver cyst fenestration in patients with PCLD. Patients & Methods: We performed a prospective observational trial enrolling all patients undergoing laparoscopic liver cyst fenestration for symptomatic PCLD at two major tertiary referral centers between August, 2005 and April, 2007. Liver volumes were measured with pre- and postoperative CT scans, operative and hospital outcomes were recorded, and all patients completed an externally validated symptom-based questionnaire 4 weeks before and after surgery. Results: Twelve patients, all female, median age 45 (35-58) years were included. Laparoscopic liver cyst fenestration was technically successful in all 12 patients; there were no intraoperative complications or conversions to open. Three patients experienced postoperative complications including biliary leakage, inferior vena cava obstruction, and sepsis. All were successfully treated with medical management. Median procedural time was 123.5 (50-318) minutes and the median hospitalization was 3.5 (1-8) days. Median preoperative liver volume was 4854 (1606–8201) ml and decreased to 4153 (1556–8232) ml postoperatively, resulting in a median liver volume reduction of 12.5% (+9.5% to -24.7%). With a median follow-up time of 352 days (150-738 days), there were no symptom relapses or deaths. All patients reported an overall decrease of symptoms with statistically significant decreases in abdominal distension (p=0.01) and postprandial fullness (p=0.02). Three of ten patients reported complete relief from pain. Conclusion: Laparoscopic fenestration of liver cysts in patients with polycystic liver disease is technically feasible and appears to be safe. Patients undergoing this procedure report meaningful symptomatic relief from abdominal distension and postprandial fullness. Future prospective trials are needed to further validate our results.